Monkey Baa Theatre Company present, DIARY OF A WOMBAT, Concept by Sandra Eldridge, Tim McGarry, Eva Di Cesare, Based on the book by, Jackie French and Bruce Whatley. 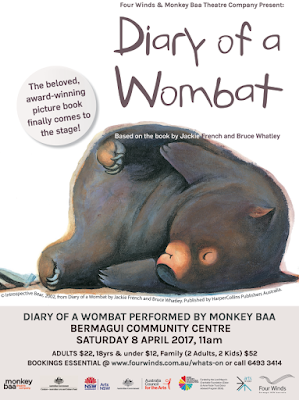 Monkey Baa, a children's theatre, has adapted the children's book DIARY OF A WOMBAT by Jackie French and Bruce Whatley. Nature, represented by Mothball, the wombat, explores his territory in search of food for his survival and comes into contact, conflict, with two humans who have built a home and gardens in his natural vicinity. Using puppetry, Design and Construction, by Bryony Anderson, three actors: Michael Cullen, Julia Ohannessian and Shandelle Pratt, under movement direction from Alice Osborne, enact this clash of 'land' possession, the actors, beside manipulating and creating the personality of the wombat, also play the husband and wife of the new house. It is also a particularly daring concept, as there is no spoken text for the 50 minutes, or so, of the action of the performance. There is only a live and electronically communicated Cellist, Mary Rapp, to accompany the incidents/adventures of the clash of the two species. Daring because the audience target is mostly aimed at the very, very, young. That that audience became almost instantly involved is a great gift to witness. The mature surety of the Monkey Baa Directors and their knowledge of the sophistication of its audience pays off in 'spades'. Eva Di Cesare has Directed the production. Set and Costume Design, by Imogen Ross, sympathetically lit by Matt Cox with a Sound Design by Kingsley Reeve. DIARY OF A WOMBAT, a sure winner for its targeted audiences, and their adult carers, too.